1. Usain Bolt, Jamaica: 9.58 sec. 2. Tyson Gay, USA: 9.69 sec. 2. Yohan Blake, Jamaica: 9.69 sec. 4. Asafa Powell, Jamaica: 9.72 sec. 5. Justin Gatlin, USA: 9.77 sec. 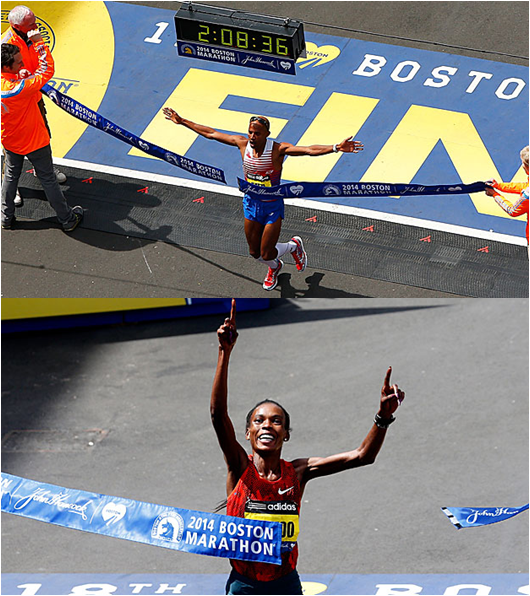 American Meb Keflezighi Has Won The 2014 Boston Marathon With The 10th Fastest Men’s Winning Time In History. Kenya’s Rita Jeptoo Won It With The Fastest Women’s Winning Time Ever. On the heels of last year’s bombing tragedy, a true American has won the Boston Marathon – the first in over 30 years. Meb Keflezighi (38 years old), who also won the New York City Marathon in 2009, came in early this afternoon at 2:08:37. That’s the 10th fastest winning time ever. Keflezighi emigrated to the United States with his family at the age of 12 from Eritrea, Africa. He attended middle school and high school in San Diego, before finishing up his education as a graduate of UCLA. On the women’s side, Kenya’s Rita Jeptoo won her third Boston Marathon and second of back-to-back – with the fastest women’s winning time in history. Now how about that? She’s just 10 minutes off of cracking the men’s top 10. And how about that! Please take a look at yesterday’s post, Sports List of the Day‘s tribute to victims of the bombing and multiple winners of the Boston Marathon. Take time to remember those who lost their lives and their families, and those who were injured, however you feel appropriate. Tomorrow will mark the first Boston Marathon since last year’s bombing, which took the lives of three spectators and later an MIT police officer. Hundreds were injured, many severely and some with forever life-altering physical damage. …and those who were injured. Remember those affected by the tragedy in your prayers or in whatever manner befits you. Thank you. I wanted to do a post today on the Boston Marathon as my way of remembering – and also to call attention to what is truly an historical and world-class event in a world-class city. B strong. 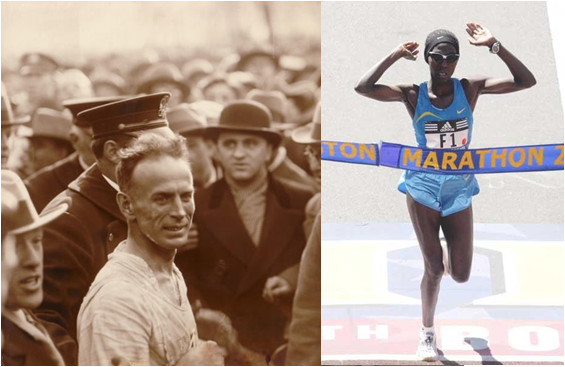 Below are the men and women who have won multiple Boston Marathons. UPDATED LIST: Through the 2014 Boston Marathon. Kenya’s Rita Jeptoo won her third.